She won the $1.4m prize for her work for the rights of women and children in Iran, in a year when other names mentioned as being in contention included Pope John Paul II and former Czech President Vaclav Havel. Ms Ebadi said it was worrying that human rights were being violated by the same Western democracies that had introduced the principles. And she singled out the alleged breaches of the Geneva conventions at the Guantanamo base in Cuba where the US has been holding more than 600 mainly former Taleban suspects for more than two years. "Why is it that some in the past 35 years, dozens of UN resolutions concerning the occupation of the Palestinian territories by the state of Israel have not been implemented promptly?" she said. "Yet, in the past 12 years, the state and people of Iraq, once on the recommendation of the Security Council, and the second time in spite of UN Security Council opposition, were subjected to attack, military assault, economic sanctions, and ultimately, military occupation?" "The people of Iran, particularly in recent years, have shown that they deem participation in public affairs to be their right, and that they want to be masters of their own destiny," she said in her acceptance speech. She has vowed to press the Iranian Government to put into practice the international human rights treaties it has signed but not implemented. Ms Ebadi says she will step up her activities and those of her NGO, the Centre for the Defence of Human Rights. 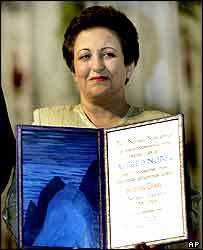 Mrs Ebadi's award aroused huge controversy in Iran. 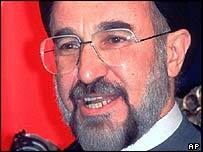 Reformist President Mohammad Khatami has described the award as political and not important. Ms Ebadi was the first female judge in her country, but was forced to resign following the Islamic Revolution in 1979. "She's been a persistent irritation to Iran's conservative rulers"